Ok, so after a rather too long hiatus (my fault), the ‘My Favourite’ series of posts is back. Up first is the cracking topic of favourite childhood films. This is an interesting one, because often the films you love as a child turn out to be… well ill-advised choices attributable to our youth. Back in the day, not too long ago, video cassette tapes were all the rage. Frequently, I wore tapes out til the colour had faded and constant static fuzz pervaded the television screen. One film that I repetitively hired from the video shop (until I bought it as an ex-rental) was Problem Child 2. I spent years rewatching this film religiously. It even took a while until I saw the first Problem Child (a much inferior film). Picking up from the troublesome adoption that surrounded the first film, Ben Healy (John Ritter) and his son Junior (Michael Oliver) have left their home town of Cold Rock and moved into the leafy green suburban paradise of Mortville. Newly divorced, Ben finds no trouble attracting attention from the ladies, as the town has a 50:1 ratio of women to men. Junior is not pleased with this development, wanting the sole attention of his devoted dad. Junior subterfuges Ben’s multiple dates with much success until the richest woman in town appears. Lawanda Dumore (Laraine Newman) is a Southern Belle with an overly anxious libido, and once Ben appears in her radar, she literally moves in and takes over. Meanwhile, Junior makes an enemy in local school girl Trixie (Ivyann Schwan). As marketed in the film’s tagline, he’s bad but she’s worse. The two battle it out until we meet her mother Annie; the school nurse (Amy Yasbeck). Ben and Annie hit it off immediately, as the score tells us with the sweet sentimental music. But their relationship is fraught from further potential due to Trixie’s rebellious, all-consuming ways, and Ben’s impending marriage to Lawanda. Of course, Junior and Trixie step in and make the necessary changes. Problem Child 2 is not the greatest film in the world by far, but its energy is playful and wicked. Capitalising on the title, Junior and Trixie are given ammunition to swear, use dynamite and constantly raise their middle ringer. Born wild, Junior manages to not only fuel a propane explosion in a neighbour’s BBQ, but induce mass vomiting on a fairground attraction ride. The late, great John Ritter is warm and funny as Ben Healy. Ritter has clear chemistry with his off-screen wife Yasbeck, as well as with Oliver. Joyfully, Jack Warden and Gilbert Gottfried return as the obnoxious Big Ben Healy and Principle Peabody, and Laraine Newman is hysterically demented as Lawanda. Like Looney Tunes cartoons, characters are blown up, fall out of windows high above the ground and survive to tell the tale. Simply put, Problem Child 2 is a whole lot of fun and still hilariously enjoyable over twenty years after it was first released. James Madden is the Editor of Film Blerg. He is currently undertaking a Master of Arts and Cultural Management at the University of Melbourne and is a Screen Editor of Farrago Magazine. James has contributed to countless student and online publications including Portable, T-Squat and Upstart. When I first saw Cool Runnings at age 7, I hadn’t seen many movies at all, let alone underdog movies. Cool Runnings captured my heart and imagination in the dramatic way that only a child can experience. I often wonder if, had I seen this movie at, say, age 24, if I would feel the same way about it. Probably not. It’s light-hearted and affable, but completely formulaic, the sort of movie that you sit through, laugh once or twice at, and then forget about it. I didn’t see this movie as a 24-year-old though – I saw it as an eager and impressionable 7-year-old, and I remember being completely inspired by the idea that Jamaica could field a respectable bobsled team. It helped that Cool Runnings is filled with characters that my seven-year-old self could really relate to (or at least, thought I could). I related to the pain that Derice felt when he didn’t qualify for the 100-metre dash and I related to Derice’s rebellion against his controlling father. The characters were brought to life by genuinely impressive performances by the principal cast: Leon as Derice Bannock, Doug E. Doug as Sanka, Rawle Lewis as Junior, Malik Yoba as Yul Brenner and, of course, the avuncular John Candy as Irv, the forlorn former bobsled champion, sodden with drink and cramped by regret. Cool Runnings was John Candy’s last really noteworthy film – he completed Wagons East and Canadian Bacon before his passing in 1994, but public opinion condemned those in a way diametrically opposed to the esteem that Cool Runnings is held in. But, as with all of these “Favourites”, this choice is an intensely personal one. 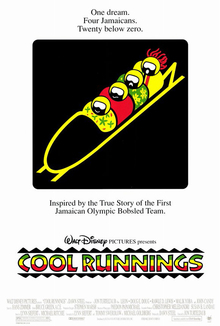 This movie is important to me because I remember practising the Cool Runnings song with my brothers, hoping that I’d never get as fat and sad as Irv did, dreaming that maybe one day I could grow up to be a Jamaican bobsledder, too. Jon Fisher is the creator and editor of The Film Brief and host of The Film Brief podcast which you can find on iTunes. Settling on my favourite childhood film necessitated a bit of an in-depth thought process. Immediately films like Back to the Future, Jurassic Park and the James Bond films sprang to mind. But pondering this more, I realised that these were films I loved from my childhood, that still held up as classics now I am an adult. They were not my absolute favourites at the time though. Childhood films for me were all about school holidays and the local video shop. When Mum would let you go down to the store and hook up the 5 weeklies for 10 buck deal, or whatever they had going on. And in my mind there were two films that I raced for more school holidays than not – Home Alone and The Sandlot Kids. I think the latter just shaved the former though in terms of favouritism. My adoration of The Sandlot Kids is somewhat inexplicable. It’s not necessarily considered a classic, though I am sure many of my vintage have fond memories of it. Also, it’s a story of a distinctly American childhood, one dominated by baseball. I really enjoy watching baseball now, but as a kid when I was loving on this movie, I had zero knowledge of it, and zero interest in learning more about it. it the centre of the universe for a group of young boys. The narrative is stock standard kids film fare. The new kid in town, summer vacation, cool kid taking the nerd under his wing etc. But these familiar tropes, delivered through a witty script, are put to good use in showing the value of friendship and the joy of childhood. Performance-wise, the film excels, and I think that this explains a lot of why the film still holds up for me when watching today. Dennis Leary and Karen Allen of Indiana Jones are wonderful choices for the parents of the main character Scotty Smalls. And the performances by a number of the kids are really great actually. Chief amongst them are the charismatic leader of the pack Benny played by Mike Vitar, and the wonderful Patrick Renna (who is somewhat ubiquitous in family films of this vintage) as the hilarious Ham. Re-watching this recently, I can see why I was such a fan of it as a kid. Everything is done with so much charm and I still absolutely love the film.